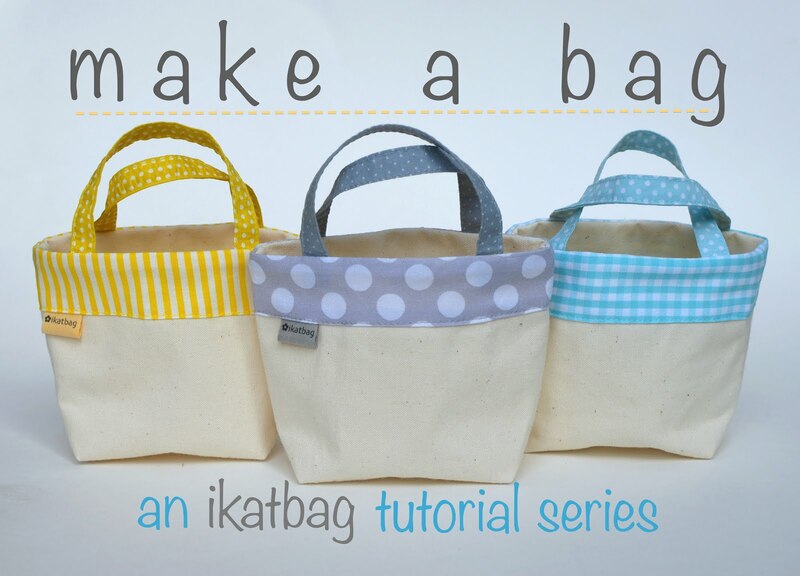 ikat bag: Make A Bag! Just between you and me (and - given that this is a blog - the whole boundaryless internet, really), I think I'm nuts. I mean, I'm in Relaxed Mode right now, with Halloween and birthday party season finally over and no costumes to make and -for the most part - boycotting the Handmade Christmas Gifts For Own Family movement etc. And what do I do to relax? Write tutorial series(es), that's what. Remember last year? Just before Christmas, I did the tutorial series on adding lights to toys. Happy as a lark, writing about LEDs and Physics. The year before that, I did the Pockets Series. It's a bad habit, clearly, because I'm back at it again this year. Last week I did the two-parter on winter hat making. Which was really only a warm-up to this next tutorial series I'm about to introduce. More on that in a while, but just wanted to say that I am honestly perplexed at why I can't just "relax" like most regular folks, whatever "relax" means. Maybe I desperately need nutella again. Or a real beach, with real seawater at 26C (no, I refuse to measure tropical temperatures in Fahrenheit - it's just wrong). So... I am very excited to introduce a new tutorial series! Their beauty shots feature designer quilting cotton or designer home-dec fabric. Their name includes the word "tote" or "clutch". They are named after a woman e.g. "Jillian Clutch". Their name includes a descriptor promising ease or speed e.g. "5-minute Jillian Clutch". They make you feel as if, with them, you can make products that can pass off as professional enough to sell in a shop. Now, I myself make bag patterns (actually, only three). And I would love it if you all continued to buy my (three miserable) bag patterns. So, what sort of tomfoolery am I up to, setting you up like this? Here's the thing: I feel almost depressed that folks feel they need to buy a pattern to make a standard tote bag. Especially beginner seamstresses. Right from the start of their exciting creative journey, they are fettered to the idea that they need someone else's patterns to sew even the simplest of projects. It's one thing to buy a commercial garment pattern to sew a dress with darts and curves but a bag is largely rectangular pieces of fabric to which more rectangles are attached. Anybody can do it. And anybody should be able to do it, without another person's pattern or instructions. Yes, anybody. Like my five-year-old preschooler and three-year-old toddler. Who both did it. It can't possibly get more anybody than that. 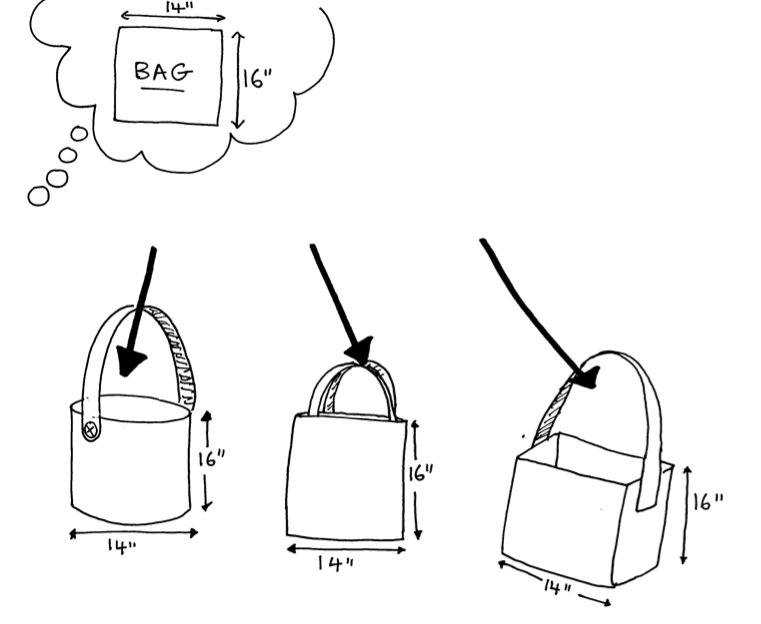 Obviously there is more to bag design than just geometric shapes and dimensions. For instance, there is the fabric, the color scheme, the texture, the multiple pockets, the way it slouches against your body or sits perkily on the ground beside a luncheon table. That's art. 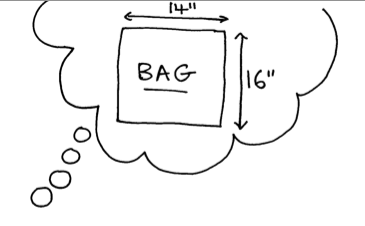 Bag pattern design, however, is Math. Like basic-elementary-school-geometry Math. I feel that when you fork out money for a bag pattern, it should be something that's unique and interesting i.e. have features that you've never seen before in other designs. Or involve new techniques that, upon mastery, add value to your current repertoire of sewing skills. Or maybe it does something exciting and magical, like morph into an elephant when you close the zipper. At the very least, it should transcend fashion and trend so that you can adapt it many times over to truly make it your own. But it should not be something you buy simply because you can't be bothered to visualize and draw out the templates yourself. Everything I know about designing bag patterns and sewing bags was learnt by simply looking at bags. 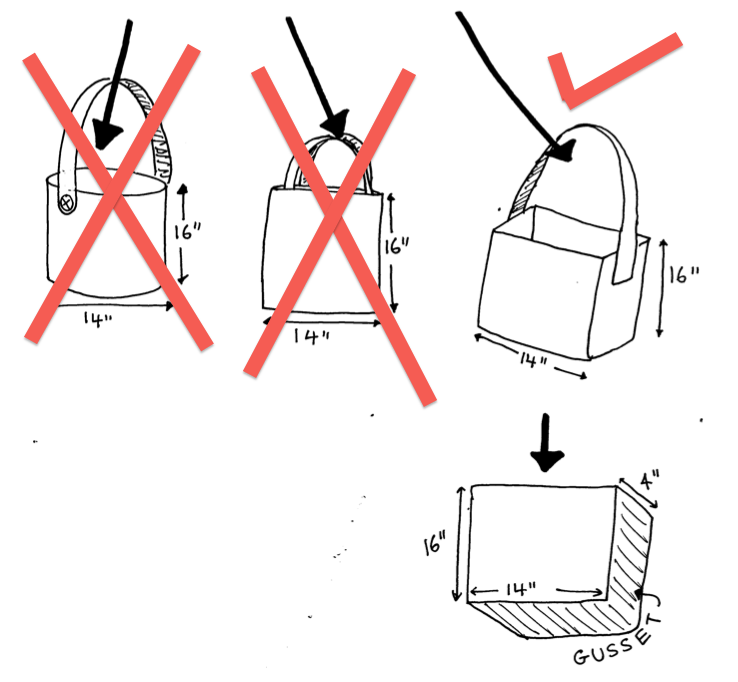 After looking at enough bags, your brain should start to form categories and sub-categories into which to group them: tote bags, flat tote bags, box tote bags, gusset bags, cylinder bags, and so on. Each of those categories has a standard method and sequence of construction. And every subsequent bag you see can then be analyzed into one of those categories and - voila! - you will instantly know how to make that bag. 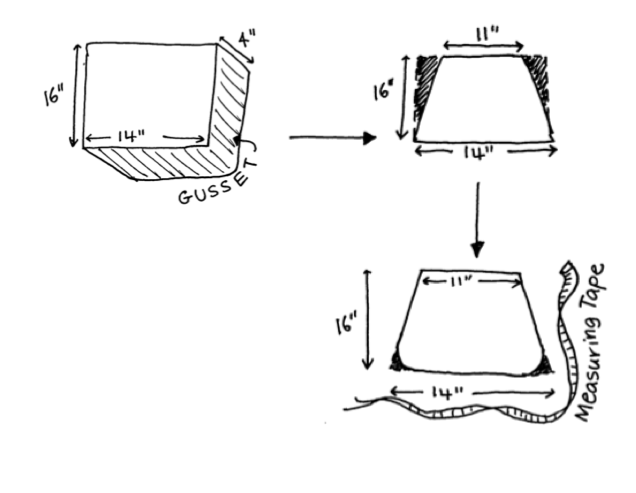 If you draft clothing patterns from blocks (aka slopers) like I do, you might know what I mean. Every garment begins from the featureless basic block, which is then modified to create categories (e.g. a princess-line shift dress) and subcategories (e.g. a sleeveless, boat-neck princess-line shift dress) of garments with embellishments (e.g. a sleeveless, boat-neck princess-line shift dress with pin-pleats at the neckline and a scalloped hem with a back slit). Add to that some construction elements (e.g. full lining, invisible back zipper, french seams) and you have designed a dress pattern. It takes time, yes, but conceptually, it's that easy. All you had when you started were the body dimensions of the wearer and a broad understanding of the kinds of garments there are on the market. I've found that, ironically, one is actually freer to create one's own garment if one just knows how garments are categorized, than if one were working with a commercial pattern that is already a variation on a pre-selected subcategory. I think of it as cooking from raw ingredients to make a Bolognaise sauce - one has much more freedom to steer the flavor in a particular direction than if one were trying to adapt a bottle of Prego by adding more onions, or trying to mute the taste of garlic with extra wine. Provided, of course, one has foundational knowledge of how sauces, in general, are put together. Bag making is exactly the same. When I design a bag, I begin with the dimensions of the finished bag - I want it to be a certain size for a particular purpose: to contain all my baby paraphernalia or swimming gear for all three children, or a pair of red- and white-wine bottles, for instance. With those numbers, I mentally sift through different shapes that have those dimensions. Then I pick one, and decide how that shape is made from individual flat pieces of fabric. Then I calculate the sizes of those individual pieces of fabric that make up the shape. Next, I sculpt its shape - round off its corners (how round? ), maybe taper its opening (how slanty?). And I fine-tune the dimensions of those flat pieces of fabric, manually re-measuring the parts that cannot be conveniently calculated. To this I add the features I want it to have - straps (how many? How long? Attached? Detachable? ); pockets (where? What kind? How large? ); fasteners (buttons? Magnetic snaps? Buckles? Drawstring cord? ); embellishments (ruffles? Pleats? Yoke? Purse feet? Piping?). Finally, I choose the construction method: fully lined or unlined (french seams or serged seam allowances? 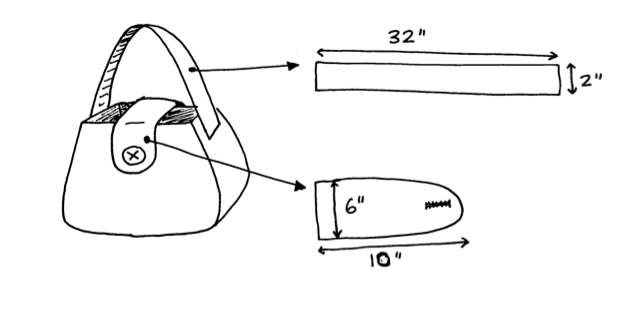 ), flat seams or externally bound seams, hole-in-the-lining or topstitched opening? And there - I have designed a bag. Without even broaching fabric, interfacing or color scheme. Just as with garments, all I had when I began were the dimensions of the finished bag and a broad understanding of the categories of bags (or geometric shapes of three-dimensional solids, if you will). When my girls grow up and are bitten by the bagmaking bug, I hope that the thought of buying a pattern or looking for a tutorial never has to cross their minds. They should (provided they stayed awake in their Math classes) be able to design their own and thus freely turn it into whatever they want it to finally look like. This series, like everything else on this blog, is for them. But it is also for you, as an early Christmas present from me. I hope it changes the way you look at planning and design and gives you a good foundation and the confidence to say, "I can do it myself". Or, at the very least, open your eyes to what goes into making a bag pattern so that you can better appreciate the ones that are truly worth your money. May you keep buying the patterns you love and also enjoy learning to make some of your own. Here's to empowerment- see you soon for Chapter One! Some people just like to be blind followers, though. They like predrafted pattern pieces, detailed instructions, and inspirational pictures of finished items. I like to do some design myself, but I also like to use patterns. Guess it depends on my mood and whether I'm sewing to unwind and relax or sewing to expand the reaches of my brain (which can be as stressful as it is rewarding!). Making a bag is just like anything else: if you look at something hard enough, you'll find out how it works. But if you're not already familiar with sewing, you do need that first insight into the world of bagmaking to get off the ground -that first push and a glimpse of the tricks of the trade. My first bag was from a bag book with patterns. That was the first and last time I followed a pattern. But I couldn't have done it without it. How absolutely timely. I want a bag, but I can't find a pattern (or even an already made bag to copy) that is just what I want. Thank you for this. It's given me the courage to dive in and create. I don't get it either. But some people can't do creative things without explicit instructions. Hopefully it is a confidence issue, and you are helping to eradicate those pesky fears that get in the way. Looking forward to it, as I am mid design into making a new bag, and my reason's for making it keep changing, and therefore the design varies accordingly. (that and I'm knee deep in too many other Christmas and other projects to have paid any attention to my New Bag project) And thank you for your tutorials, they are very thoughtful and nice and a great creative nudge. Yay! I'm excited to learn more about how your mind deconstructs a bag! I've got the basics of bag making down but there's always more to learn - and I know you always emphasize techniques which I really need to brush up on. And with the holidays comes time off work so there's time for stuff like sewing!!! I see a physics teacher peeking out... you know "F=ma... the rest is detail." Well, except for that thing about relativity and going really fast and massless electrons... ;-) But I do love the physics way of understanding what's going on and then being able to use that knowledge flexibly. Thank you for making me have such happiness tonight. I'm looking forward to to this. I have recently gotten into bag making. I agree that a pattern should not be necessary to make a bag. Excitement plus!!! Recently made my first bag with two others on hold while a birthday party was organised and Christmas/ end of school year functions/ parties are prepared for and attended. I loved maths at school and didn't realise until reading your post that that is probably why I enjoy the mental process of working out my own very simple patterns from existing things that I have. All that adding up and subtracting and multiplying : )Really looking forward to this series. By the way still laughing about the elephant transformer bag - my girls would really love one of those! I stumbled upon your site quite by chance and much to my delight. I'm so impressed about what I've read so far. Needless to say, you are one exceptional woman and I love the fact that you are confident enough to share your ideas and actually go through the processes of tutoring your readers. Happy holidays! Hi, you sounded so singaporean when you said you could not relax. I guess the way we relax is to do something we enjoy though it might not be relaxing like 'just chilling out and doing nothing'. 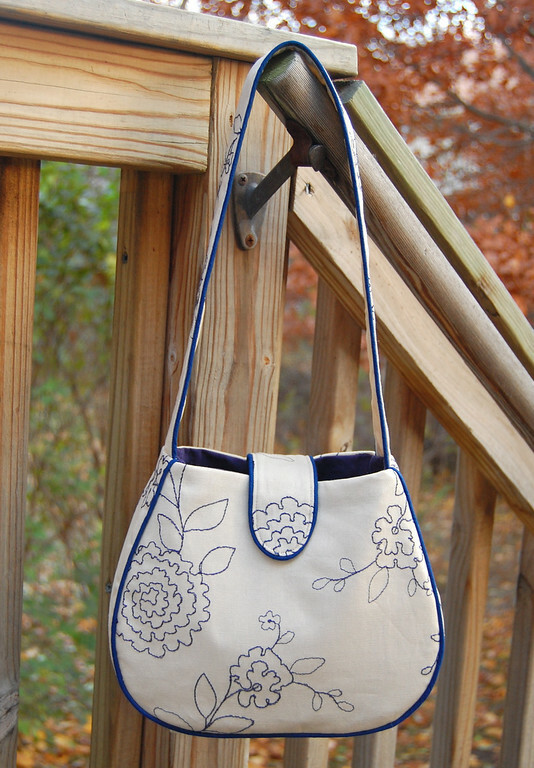 I am getting a sewing machine for christmas and I am that beginner who might buy a bag pattern. I will continue to read your GREAT blog to improve my sewing skills. Thanks for sharing and Merry Christmas. But what I need is a purse. I've been looking for months for a new purse that meets my apparently crazy requirements and for some reason it never crossed my mind that I could MAKE it! THANK YOU!! I am looking forward to reading this series and learning how to create my own purse! Ooh, I look forward to this (I'm a month behind in my feed reader, as usual, so it's looking forward for me) - I've had some of the same frustrations you've mentioned. And all the internet tote tutorials seem to be, attach handles to a poorly constructed pillowcase and be impressed by the results! Thank you for your interesting blog...you hit the nail on the head in so many ways. You just gave me more confidence and the will power to design my own bags. I have read and printed off tutorials and patterns etc. and have over 4,000 bags on my board. After i read your blog, i feel so ready to move forward with my plans of a little purse..tote bag business.